There are many strange happenings in the wizarding world, whether it’s the horrific visions Harry views whenever he sleeps, the strange disappearance of Hagrid, or the arrival of a new Dark Arts teacher, Mrs.Umbridge. 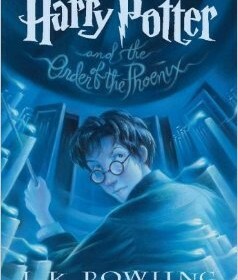 Harry Potter and the Order of the Phoenix is starring Harry, now in his 5th year at Hogwarts, along with his friends Ron and Hermione, now Perfects, the main characters are ready to tackle anything that comes in their way. The plot thickens with the antagonists; Malfoy and the wicked Mrs. Umbridge. Mrs. Umbridge works for the Ministry of Magic and thinks Harry is a crazy lunatic for trying to warn people of the return of Lord Voldemort. Not only does she have the ability to make any insane rule for the school, but she can also fire any teacher she feels is unsuited or doesn’t like. Within the storyline, Harry has a wide assortment of emotions from anger to glee. He is going through a cluster of feeling due to the stress of his horrific visions, and the viewing of Voldemort alive. On top of having to deal with school, Harry now is part of a secret organization called to Order of the Phoenix, at Sirius’s house. Adding to that, he is the leader of a Defence against the Dark Arts group called Dumbledore’s Army. Although it may seem Harry’s life is becoming worse, Harry grows stronger, he’s more willing to take chances, and acquires much-more self-sufficient when facing his opponents. Honestly, it seems the more Harry loses to his opponents, the more he is ready to fight. The way responsibility is shown in this book, is shown in an interesting manner; Harry had lots of friends to take after. In this adventure, Harry now has to deal with being the sole person to find and fight Lord Voldemort, no matter the cause, no matter the challenge. Though the book has an amazing lesson it has some huge flaws. Without spoiling most of the book, I can say that it feels like the entire world hates him. As it seems that he losing his friends, family, and prized possessions to sudden that it makes it seem like he can deal with the loss. While I dislike this part I can understand why the author does it. Like Harry, there are many people who lose an abundance of things that were a huge part of their lives. Similarly, they could be feeling a cluster of emotions. They also could be pushing away the ones that try to help, but they can be strong. Like Harry, they can deal with the loss of others, and try to achieve a victory on their side. This outstanding representation of real-life issues is why the Harry Potter series is stupendous, as they know exactly where to go to make whatever happens relatable. In conclusion, Harry Potter and the order of the Phoenix is a fantastic book for any age group. Whether it’s adult, teen, or child, it unlocks that imagination and child-like wonder that anyone enjoys experiencing.